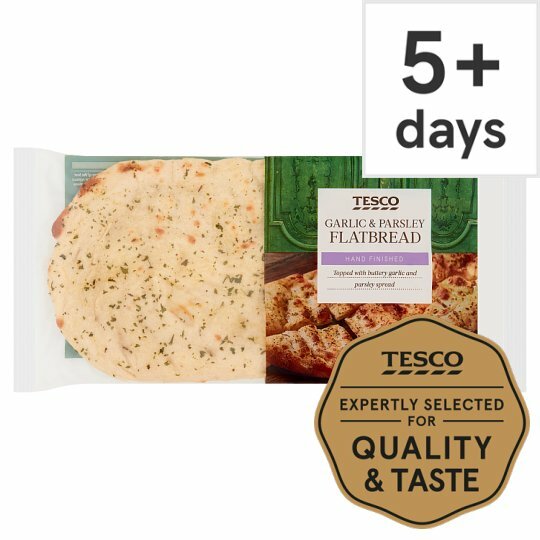 Flatbread topped with garlic and parsley spread. Wheat Flour (Wheat Flour, Calcium Carbonate, Iron, Niacin, Thiamin), Water, Garlic & Parsley Spread (8%), Semolina (Wheat), Yeast, Extra Virgin Olive Oil, Sugar, Salt, Preservative (Calcium Propionate), Parsley. Garlic & Parsley Spread contains: Palm Oil, Rapeseed Oil, Garlic Purée, Water, Butter (Milk), Salt, Parsley, Concentrated Lemon Juice, Emulsifier (Mono- and Di-Glycerides of Fatty Acids), Flavouring, Colour (Beta-Carotene). Instructions: From chilled: 200°C/ Fan 180°C/ Gas 6 7-8 mins Place on a baking tray in the centre of a pre-heated oven for 7- 8 minutes. Instructions: From frozen: 200°C/ Fan 180°C/ Gas 6 10-12 mins Place on a baking tray in the centre of a pre-heated oven for 10-12 minutes.